LAHORE: Punjab Chief Minister Sardar Usman Buzdar on Thursday expressed confidence in the armed forces and said he was satisfied that the defence of the country was in safe hands. Speaking at a special ceremony held under the aegis of IV Corps of Pakistan Army on the Defence and Martyrs’ Day at Fortress Stadium, the chief minister commended the skill of the performers, especially the paratroopers, and also met with the families of martyrs. He appreciated the competence of Pak army and rangers and said that history was glowing with the sacrifices rendered by them. “The martyrs defended the motherland bravely. The Defence Day of Pakistan reminds us of those great souls who sacrificed their present for our future. The entire nation was united like a solid rock during the war of 1965 and Pak army proved its mettle in this war,” he added. 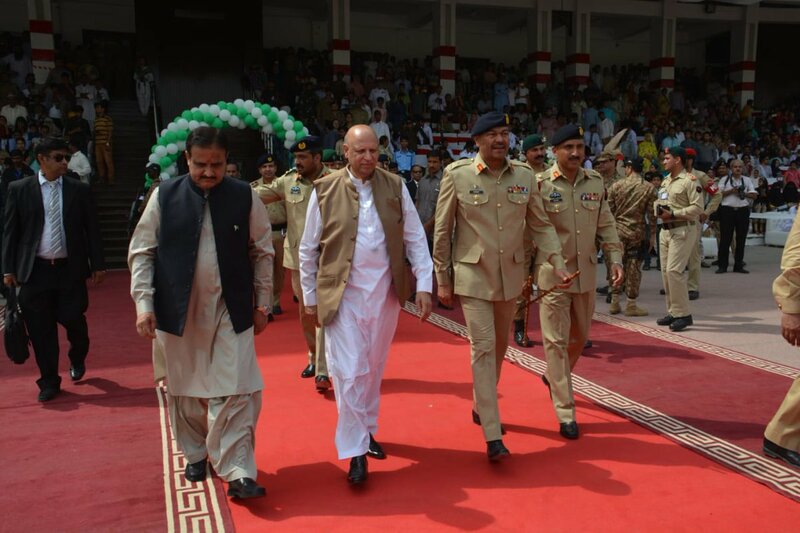 Punjab Governor Chaudhry Muhammad Sarwar, Corps Commander Lt Gen Amir Riaz and other dignitaries also attended the ceremony in which Pak Army and Rangers personnel exhibited professional competence. The heirs of martyrs of armed forces of Pakistan were also present. Separately, Chief Minister Buzdar said the government had accepted the challenge to offset the looming economic crisis besides reviving the industrial sector and restoring the confidence of investors while also generating new jobs for the unemployed youth through skill development programmes. Speaking to Pakistan Furniture Council (PFC) Chief Executive Mian Kashif Ashfaq at a reception dinner hosted in honour of Punjab Governor Chaudhry Muhammad Sarwar by Pakistan Tehreek-e-Insaf (PTI) Central Vice President Chaudhry Muhammad Ashfaq on Monday night, he said that the government would take all available resources to boost small and medium business in the province. “Poverty has been swelling in the country and the only solution to control inflation is to flush out rampant corruption by taking a stern action against those indulged in corrupt practices,” he added. The chief minister said that Pakistan had the talent but lacked the skills. “Our government’s main focus will be on skill development so that people can perform their best,” he said. Appreciating the role of PFC in promoting furniture sector in the country, CM Buzdar said Pakistan furniture industry had the potential to dominate global markets with innovative designs and could make a substantial contribution of billions of dollars export annually. PFC Chief Executive Mian Kashif Ashfaq, at the occasion, said that the market potential of Pakistan’s handmade furniture was unfathomable and the government should make policies in accordance this. He highlighted the importance of controlling increased costs and said that fluctuating economy, consumer ignorance and defective legislation were among the major hurdles in the way of market instability. Ashfaq also stressed the importance of developing legislation against the use of Sheesham trees and dedicated forestry zones for furniture. He further said the demand for Pakistani furniture articles in international markets was at rise and there was a need to pay attention to the provision of raw wood and proper training to carpenters. He also apprised the chief minister of issues and challenges small and medium business community were facing. “The incumbent PTI government should financially assist furniture makers in the country so that they visit international markets which will provide them ample chances to explore new avenues by sharing vision and expertise for the formulation of future policies, economic studies, sectors and project specific reports besides promotional efforts,” he concluded. Federal Minister for Petroleum Ghulam Sarwar Khan was also present on the occasion.